1 year, 3 months ago Edited by Karan Joisher on Dec. 24, 2017, 5:55 p.m.
FlipPCx : PCx + seconds left until frame flip occurs. Assume that steps 1) and 2) take 10ms. As we have high latency, the start of our audio write will be from write cursor(WC0). 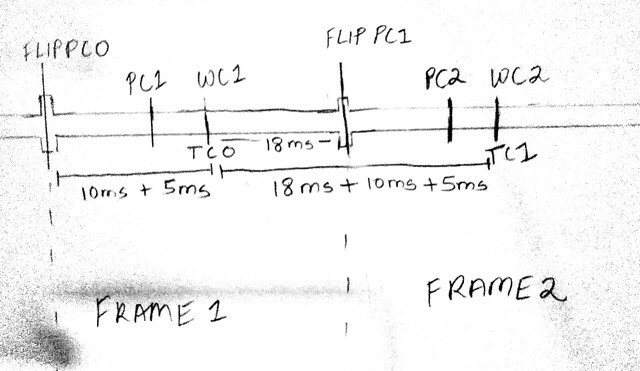 1) The next chance that we'll get to write the audio buffer(i.e next time we reach step(3) of our game loop). Thus minimum target cursor location(TC0) would be the position of play cursor on next frame(PC1) else we'll have unfilled samples between TC0 and PC1 causing audio bugs. step(3) we'll have to start writing from TC0 which falls in between PC1 and WC1. (This scenario is shown in FIGURE 1). So taking these two cases in consideration: we need to be (PC1 - WC0) samples ahead of WC0 to satisfy criteria(1) and an additional LATENCY seconds ahead of that. Samples will be filled from W0 to TC0. Samples will be filled from FlipPC0 to TC0. Samples will be filled from TC0 to TC1. - Is whatever I mentioned above correct? that; is this done for not passing on the complexity to the game? Your explanation seems correct (although it has been a while since I watched those episodes). 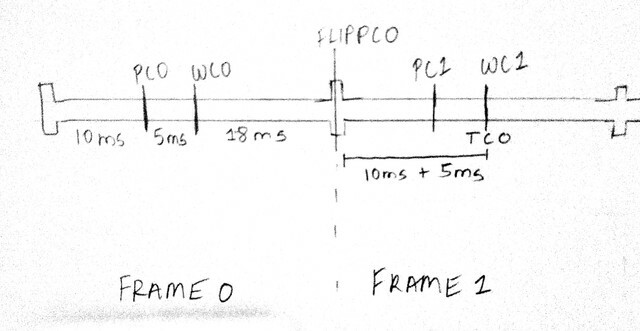 Even with low latency we want to write a entire frame because we work in frames, we don't want to write sound several time per frame. I believe that even if we wrote sound several times per frame, the "perceived" latency would not change because sound is continuous (the membrane of your speaker is always moving). Since Windows Vista, Direct Sound is "emulated" (using Core Audio API) and you can't have low latency. I believe the lower you can get is 30ms meaning the write cursor will always be 30ms ahead of the play cursor. If you want a low latency API mmozeiko made a version of day 19 using WASAPI.